The Team-Taught Cohort Model for preparing pre-service teachers to use technology in their classrooms involves a “block” of courses in combination with a field experience in the second year of a four-year university program. Pre-service teachers are placed in cohort groups that participate in intensive coursework in curriculum, instruction, assessment, classroom management, and technology integration in balance with 18 full days of practicum experience. This model provides pre-service teachers with an authentic opportunity to integrate technology into a unit based on strong educational theory and current research, and an opportunity to spend quality time in a middle or high school classroom with a mentor teacher while being supported and coached by a team of university faculty members in a technology-rich environment. Four surveys were administered generating seven measures for each group of students. Effect Sizes measured using Cohen’s d ranged from 0.43 to 2.14 across the four semesters of students in the Team-Taught Cohort Model and from 0.24 to 1.12 across the two semesters of the comparison group in the Traditional Model. Results indicate that the Team-Taught Cohort Model is successful in increasing pre-service teachers’ competence and confidence in technology integration in the classroom. Ward, G. & Overall, T. (2011). Technology Integration for Pre-Service Teachers: Evaluating the Team-Taught Cohort Model. 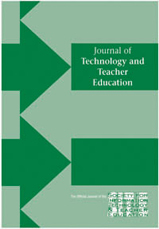 Journal of Technology and Teacher Education, 19 (1), 23-43. Waynesville, NC USA: Society for Information Technology & Teacher Education. Retrieved April 19, 2019 from https://www.learntechlib.org/primary/p/31387/. Campbell, D. T., & Stanley, J. C. (1963). Experimental and quasi-experimental designs for research. Boston: houghton-Mifflin. Clandinin, D. J., & Connelly, F. M. (2004). Narrative inquiry: Experience and story in qualitative research. San Francisco: Jossey-Bass. Dwyer, D. (1994). Apple classrooms of Tomorrow: What we’ve learned. Educational Leadership, 51(7), 4 – 10. Fullan, M. (2005). Professional learning communities writ large. In duFour, R., eaker, R. & DuFour R. (eds. ), On common ground the power of professional learning communities (pp. 209-223). Bloomington, In: solution Tree. Gabelnick, F., MacGregor, J., Matthews, R. S., and smith, B. L. (1990, spring). Learning communities: creating connections among students, faculty, and disciplines. New Directions for Teaching and Learning, 41, 19-37. Griffin, D., & Christensen, R. (1999). Concerns-Based Adoption Model Levels of Use of an Innovation (CBAM-LOU). Adapted from hall, loucks, rutherford, & Newlove (1975). Denton, Texas: Institute for the Integration of Technology into Teaching and learning. Hall, L. (2006). Modeling technology integration for preservice teachers: a PT3 case study. Contemporary Issues in Technology and Teacher Education, 6(4), 436-455. Hancock, R., Knezek, G., & Christensen, R. (2007, June). Cross-validating measures of technology integration: A first step toward examining potential relationships between technology integration and student achievement. Paper presented at the national educational computing conference, atlanta, Ga. Knezek, G. A., christensen, R. W., Miyashita, K. T., & Ropp, M. M. (2000). Instruments for assessing educator progress in technology integration. Denton, Texas: Institute for the Integration of Technology into Teaching and learning. Maddux, C., & Johnson, L. (2005). Internet applications of type II uses of technology in education. New York: The haworth Press, Inc.
Niess, M. L. (2008). Guiding preservice teachers in developing TPcK. In aacTe committee on Innovation and Technology (eds. ), Handbook of technological pedagogical content knowledge (TPCK) for educators (pp. 223-250). New York: routledge. Ropp, M. M. (1999). Exploring individual characteristics associated with learning to use computers in pre-service teacher preparation. Journal of Research on Computing in Education, 31(4), 402-424. Russell, A. L. (1995). Stages in learning new technology: naive adult email users. Computers in Education, 25(4), 173-178. Sands, D. I., & Barker, H. B. (2004, Fall). Organized chaos: Modeling differentiated instruction for preservice teachers. Teaching & Learning, 19(1), 26-49. Seifert, K. & Mandzuk, D. (2004, February). How helpful are cohorts in teacher education. Paper presented at 25th Forum for ethnography in education, Philadelphia, Pa.